We had such a wonderful time watching the AT&T Red Carpet and the 50th CMA Awards ceremony. From Dolly Parton receiving the Willie Nelson Lifetime Achievement Award, Randy Travis singing the final “amen” in his song “Forever and Ever, Amen,” Beyoncé singing her song “Daddy Lessons” with the Dixie Chicks (which brought the highest viewership the show has ever had during that one performance) to Taylor Swift presenting the night’s greatest honor of Entertainer of the Year to Garth Brooks. A good time was had by all. Thank you, Darden’s Delights for providing the delicious pies for the watch party. We nibbled on Darden’s Dangerously Delicious Fudge Pie and Darden’s Super Luscious Butterscotch Pie with Pecans. YUM! Darden’s Delights was established to harness the power of entrepreneurship for the benefit of individuals with developmental disabilities. They are not a non-profit. They believe in challenging conventional thought by building a thriving business to enhance opportunities for people with developmental disabilities. With each pie purchase, a “slice” of the proceeds will be used to support organizations that improve the lives of individuals with developmental disabilities. This event was sponsored by AT&T and the text was written by me on behalf of AT&T. Get Social with Darden’s Delights! One of my favorite places to visit during the winter months is Captiva Island, Florida. Living in Atlanta, it doesn’t get extremely cold nor do we experience hardly any snow, but who needs a reason to get away and go to the beach? 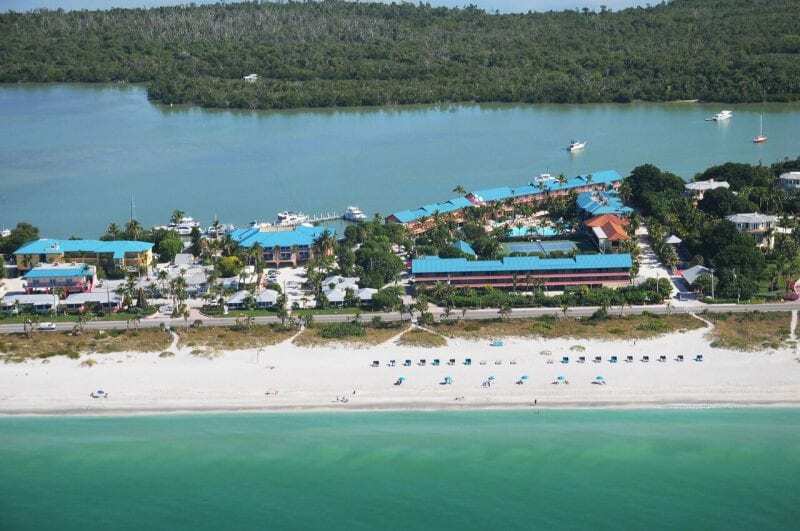 When my husband and I visit Captiva Island, we always stay at the ‘Tween Waters Inn Island Resort. It is located across 13 gorgeous beaches-to-back bay acres. ‘Tween Waters Inn Island Resort is the perfect destination for families, couples, meetings and weddings -with 137 quality accommodations including 19 uniquely themed cottages, one, two and three bedroom suites, and comfortable contemporary guest rooms and efficiencies. ‘Tween Waters Inn Island Resort was established in 1931 and just recently was designated a national historic landmark in Florida. The Old Captiva House, the Inn’s fine dining restaurant, still reflects much of its original charm of when it was first built — from picturesque walls of white French doors, to hardwood floors, to the Gulf of Mexico sunset that streams through the western windows. The bay is just a few steps behind the Inn with access to water sports and deep sea fishing tours. When we visited this past December, we hired a deep sea fishing tour and caught the strangest catch. My husband caught a blowfish and I caught a lizardfish (something I had never heard of or seen before). In the end, we ended up catching a few grey snapper which the chef at the Crowe’s Nest Bar & Grill prepared for our dinner. The Crowe’s Nest Beach Bar & Grill (the inn’s casual dining restaurant and bar) is a local island hangout spot with nightly entertainment. I love to look for shells on the beach wherever we travel. My collection includes shells from all over the world. I can honestly say, that Captiva Island and Sanibel Island (a quick bike ride away from Captiva) are a shell lover’s paradise. The “Sanibel stoop” nickname was coined by the locals on Sanibel Island after watching tourists with their backs hunched over scouring the beachfront in search of shells. If you are a shell collector, a trip to Sanibel and Captiva islands is a must do! The staff at ‘Tween Waters Inn Island Resort are extremely friendly and a significant amount of them have worked there for years – – a strong indication of their dedication to the facility and their appreciation of the hotel’s management. We can’t wait to return to Tween Waters Inn Island Resort this December for our annual trip. Try one of their signature drinks while you’re there! Bangkok, Thailand – L to R: Charlie Miller, Autumn Murray, and Rodney Murray. I have traveled to Bangkok, Thailand twice and we are returning in the summer of 2018. When I was there the first two times, I was traveling with my husband. He was there on business and I tagged along. I did most of the site-seeing by myself as he had to work. I also spent countless hours getting Thai massages and Thai foot massages. Bangkok is the capital of Thailand and has an estimated population of over eleven million. It is crowded, traffic is constant, and the temperature is always hot. However, if you love great food, exploring temples and palaces, and shopping – – you should definitely put Bangkok on your travel list. I love Bangkok and tried to convince my husband to move there as he had an option to do so with his job. Sadly, I could not convince him to give up watching real-time USA sports (basketball, football, baseball (college and professional). With the time difference, he would have to record everything. Visit at least one spa. Spas are everywhere and range from luxury to low end. However, even the luxury spas seemed reasonable to me compared to the costs of the ones in the USA. I mostly met up with my husband at dinner time. One of the restaurants we dined in was Cabbages & Condoms. Cabbages & Condoms is one of the most unique restaurants in Metropolitan Bangkok. The restaurant concept has attracted international attention for its concept to promote better understanding and acceptance of family planning and to generate income to support various development activities of the Population and Community Development Association (PDA). Their food is guaranteed not to cause pregnancy or STD’s. Okay, okay so I didn’t actually skydive. I drove my friends to and from the skydiving facility. A 14,000-foot jump from a plane doesn’t exactly sound exciting to me – – it sounds dangerous. Scaredy-cat, yep that’s me. Maddie Ley getting suited up and getting last minute instruction for her first skydive. Morgan Ley without any nerves whatsoever. However, my friends had the time of their lives doing it and want to do it again! Amy Ley and her daughters Morgan, Maddie, and Megan had the time of their lives by checking skydiving off of there bucket list. They all said it was surprisingly relaxing and peaceful once they actually jumped out of the plane. Their nerves were only in high gear when they were waiting on the plane to make the jump. Morgan giving the thumbs up all good signal. Maddie Ley is all smiles in the air. Perhaps one day in the future I will try skydiving myself. Then again, why jump out of a plane when I can stay in it and have it take me to my next travel destination and land safely on solid ground? Bundle Offer: 4+ Tickets 20% off for all 2019 Events!. Skydive Georgia offers the largest and most full-featured skydiving environment in Atlanta. It is a 9,000 square foot indoor climate controlled skydive training facility. It has the latest in modern state of the art equipment including, all Zero Porosity, state of the art reliable main canopies, digital altimeters, computerized CYPRESS AAD’s (Automatic Activation Devices) on ALL 47 parachute rig systems. Skydive Georgia also has the largest professional skydiving staff in the Eastern United States. To find out more information on Skydive Georgia and to make your reservations, visit their web site here. Skydive Georgia is famed for its committed and inventive pursuit of perfection in skydiving having developed innovative training protocols, an emotional rollercoaster of a jump and the best customer service in the business. No wonder the Atlanta Journal & Constitution (AJC) has stated that Skydive Georgia is the place to skydive in Atlanta given our 4.7 star rating in a combined number of 670 reviews on just Facebook and Google alone. Skydive Georgia has offered unique jumps from the clouds since 1999 and our staff brings a combined 30 years of experience to the table; that’s more skydive experience in the Atlanta area than any other dropzone by far! The Cedartown dropzone, located one hour west of Atlanta, caters to adrenaline junkies who want to tandem skydive, learn to jump solo or even become a licensed skydiver! Instructors at Skydive Georgia are some of the most experienced in the world, have thousands of jumps each and are ahead of the curve on emerging techniques and styles. Many go on to hold world records, and our entire staff is friendly, approachable, down-to-earth and dedicated to ensuring the happiness of each student. Skydive Georgia is not about avoiding risk. We’re about confronting a dramatic physical challenge successfully, based on rigorous training and systematic preparation, and coming out successful. We operate with the highest safety standards under the regulations of the United States Parachute Association (USPA) and the Federal Aviation Administration (FAA) to ensure we are prepared to protect your safety. For this and the above reasons, we are the best in the business. Get Social with Skydive Georgia! We hope you enjoyed Simply Amazing Living’s Skydive Georgia – Take the Plunge post. Although TAP Gastropub has been in Atlanta for years, I recently visited TAP for the first time to try out Chef Tyler Wiliams’ new menu. Recognized as “Atlanta’s Best Gastropub” by Atlanta magazine, TAP is a standout spot for seasonally-driven, innovative comfort food. An extensive international beer list and innovative barrel wine program make TAP a popular hangout spot. Upon entering TAP, you will see that the two-story restaurant has seating both upstairs and downstairs. We chose to sit at the downstairs bar where all the action seemed to be. The upstairs is where the kitchen is located and can accommodate groups as well as couples. First, just let me say that the Cheez-It Risotto with bacon is insanely good! Seriously – don’t miss this side. I am still dreaming about it while dreading the calories and what I need to do at the gym to work them off – – but it was worth it! I ordered the Kansas City strip as well and it was cooked to perfection. The size of the strip was HUGE and I ended up taking a portion home (no complaints here). The okra dish with smoked tomato and onion was also very tasty and might be able to convince non-okra fans to change their minds. The service was also fantastic. All of the staff were knowledgeable and accommodating. Before joining TAP in April of this year, Chef Tyler Williams worked with several top restaurants in Atlanta such as Bacchanalia, Abattoir and Woodfire Grill. Following his time at Woodfire, Chef Tyler Williams became known for a unique series of pop-ups and avant-garde dinners throughout Atlanta. More recently, he created Byhand, a Neopolitan pizza concept coupled with an organic farm in Lake Burton. Consumers should get their palettes prepared for what Chef Tyler Williams has in store for the restaurant on the corner of 14th and Peachtree, the third concept of Concentrics Restaurants. Lastly, I must say that TAP has one of the best patios in Atlanta due to its prime location in midtown. Great location for people watching and soaking up the actions of the city. I look forward to returning soon. Our meal was complimentary, but this in no way impacted my review. No compensation was made in exchange for this review. We hope you loved Simply Amazing Living’s TAP Gastropub Atlanta post. We hope you enjoyed Simply Amazing Living’s TAP Gastropub post. I had the pleasure of attending the invitation-only Ghost Atlas Exhibit by award-winning British photographer and cinematographer, Trevor Forrest at Dixon Rye. The event was sponsored by Atlanta Homes & Lifestyles Magazine. Trevor Forrest – Ghost Atlas Exhibit – Dixon Rye. Trevor’s work maps the world in human moments. While filming in far-flung places, Forrest captured images of Cuba, England, Iceland, Turkey, Japan, Sweden, and South Africa. This photography exhibit uses these countries as a stage for this epic journey and story, which is the Ghost Atlas Exhibit. Forrest has taken photographs for over 26 years and has been the cinematographer on many films, including a series of projects for Brad Pitt’s Plan B Production Company. He lives in NYC and works everywhere. The Designer Bradley Odom’s Dixon Rye opened to the public last October as the centerpiece of the Westside Ironworks development located at 1085 Howell Mill Road NW, Atlanta, Georgia. Conceived and curated by Odom, Dixon Rye combines elements of interiors, wares, and designs in its 4,800 square foot industrial space. The right mix is made with intention. We remember luxury’s humble origins and think raw and refined sit well side by side. We believe in the inherent personality of a space but also in engineering one. We think there is no such thing as subtlety in design…there is only intention and the right mix. Get Social with Dixon Rye! We hope you loved Simply Amazing Living’s Ghost Atlas Exhibit in Atlanta at Dixon Rye post.